← Prof Lahey’s concerns about the Nova Scotia government’s delay in responding to the Independent Review are reflected in frustrations expressed about cuts proposed for Hardwood Hill, Annapolis Co.
For those of you who missed the screening of “Burned” and the discussion that followed, I’ll try to provide a summary while the thoughts are still fresh in my mind. I’ll do this in two posts — one about the film, and one about the discussion. This documentary addresses the unsustainable use of forests to create biomass as a “green” alternative to fossil fuels. Most of the forests and the biomass plants shown in the film are located in the eastern United States. The largest biomass processing plants are along the eastern seaboard, or on the eastern part of the Gulf of Mexico. The reason behind their location is that most of the biomass is processed into wood pellets to be shipped out of various ports, bound for England and Europe — where they will be burnt to produce electricity. The enormity of the biomass industry pretty much boggles the mind. Multinational corporations set up subsidiary biomass plants and purchase forests harvested from a large catchment zone. 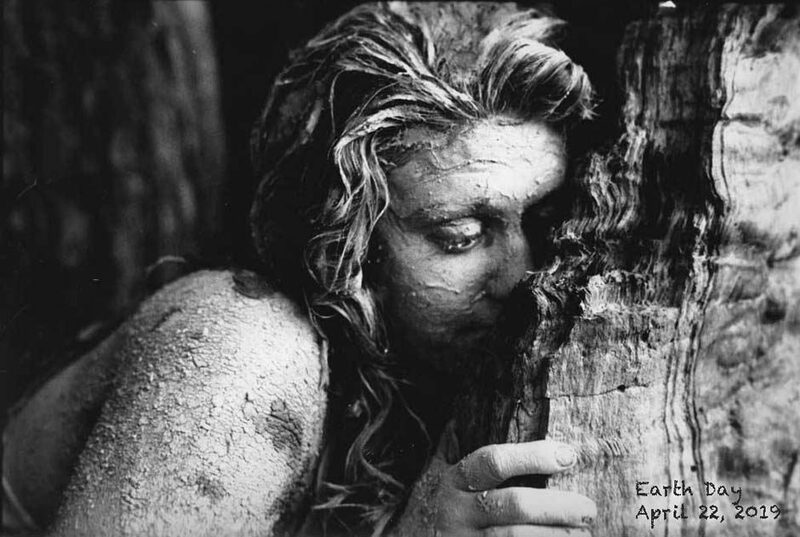 Early on in the film, several people speak of how, at the “beginning”, they were led to believe that biomass uses mainly bark, branches and dead wood. However, that myth is soon blown away as it becomes apparent that the biomass plants require far more mass than can be supplied in typical forest “slash”. Consequently, large tracts of land have been razed to keep the logging trucks rolling — at some plants, as many as 50 truckloads per hour. The harvesting is not ecological. In a couple of segments of the film, biologists discuss how trees that are valuable within a forest ecosystem – such as naturally hollow trees that are an integral part of a natural forest, are considered to be “waste trees” suitable for hauling away for biomass. The footage of cleared forests was pretty shocking — I was expecting that — but it’s still shocking. The effects of deforestation were discussed — such as impact on watersheds and the leaching of soil nutrients, and the erosion of the landscape. The film then looks at the economics of the biomass industry. It is highly subsidized — otherwise, in all likelihood — it could not exist. If the true value of the forests had to be “paid”, the industry would not be viable. What makes the whole thing work is that there is so much subsidization for “green energy” to replace fossil fuels — with countries clamouring to fulfill their commitments to reduce fossil fuel consumption. 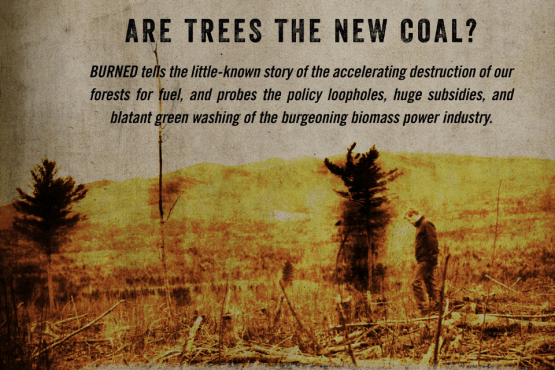 However, there is nothing “green” about burning wood in converted coal generating plants. The same pollution is blown up into the air. The “myth” of this being a “green” form of energy relies on the notion that, while the trees are being burned, their replacement trees (being planted), will offset the carbon. But, as anyone who knows much about trees will tell you, it takes a very long time for the newly planted trees to provide much in the way of carbon capture and storage. Further, the trees that are replanted, are trees that do not replace a natural forest ecology – these are just a “crop” to be harvested again at a later date. The film then turns to look at the pollution problems associated with biomass chipping and burning plants. Many of the plants that burn biomass, also burn “other” things, like old creosote-treated railway tires, rubber tires, pressure-treated wood, and building material waste — all under the dubious classification of biomass. This morning, I looked up some plants on the ENERGY JUSTICE websites, and many listed as “biomass” list multiple other fuel sources. Anyhow, suffice to say that one does not want to live anywhere near one of these plants. That’s about all the summary I will provide. Really, everyone ought to watch the film as there’s just so much information — far more than I can possibly touch on here. There are still a few more screenings happening around Nova Scotia – it will be at Acadia U on Tuesday, November 20th. If you wish to see the 3 minute trailer, check it out on Vimeo. This is “part 2” of my report — about the discussion that took place after screening “Burned” last night (Nov. 18). As mentioned in my review of “Burned”, there were over 60 people in attendance. Almost everyone stayed on for the discussion after the break. It was a very active discussion – lots of participation by many people. A lot of expressions of frustration and disgust with “how things are” with regard to management of the Crown land forests. The discussion began with a brief presentation by Donna Crossland – to help us get a handle on what’s happening with biomass in Nova Scotia. Donna put up a slide with the current biomass facilities in Nova Scotia. (see that in the accompanying photos). While some of us already knew about the biomass plants here in NS, some did not and were pretty disgusted. * finding a way to unite all of the different groups in the province (mainly internet-based) so that we are speaking with one strong voice and making our demands known. * finding out which politicians support a better approach to forestry in NS and get behind them for the next election. If they don’t support a better model, they don’t get our vote. * get together volunteer teams who will go to the forest and observe harvesting activities — keep track of numbers of trucks coming from sites — what kind of wood on the trucks — where they are going. * start performing ground-truths on tracts of Crown land so that WE know what is REALLY there — and stop accepting what is SAID to be on these tracts. Our approach will be on “forest ecology” and not just a bunch of $$$ signs of what can be harvested. * visit previously cut forest to see just what is happening with them. We get told that everything will be okay, but is it really okay? What’s growing back after these cuts? Healthy trees or just a bunch of scrub among over-turned boulders and giant machinery-made ruts? * Devise protest actions — events that will get publicity. Involve the media in “on-site protests”. * Demand that the government adopt the guidelines of the Lahey “Independent Review of Forest Practices” NOW and not “sometime later” — after a lot more forest has been hacked down. The discussion went on for a good 90 minutes or more — and people were still standing around in groups for another half hour at the end. It’s pretty clear that there is a GREAT DEAL OF CONCERN over what’s happening with OUR Crown land forests. We’re not amused. We want change. ** Note: Many in attendance signed Randall Fredericks’ petition to preserve Hardwood Hill. AND we picked up some new members for this group page. We now number 145 strong! ‘Just viewed the whole film yesterday evening in Halifax, Nova Scotia, at an event sponsored by the Ecology Action Centre and the Halifax Field Naturalists. Approximately 70 people attended, young and old. We had a discussion following the film that went on more than an hour and had to be closed off. I had read the stats about forest loss associated with the chip export industry in the southeastern US but the film really brings it home. ‘Hard to believe how little we (our industrialized society) value those magnificent, biodiverse lowland forests, but it is believable because the same is happening in relation to our Acadian forest in Nova Scotia. The images of citizens suffering from the burning of creosote impregnated railway ties from Canada are ones I won’t forget.